East Coast alt-bluegrass band Crooked Still is in the middle of their 10th Anniversary Tour, currently on the West Coast and heading south. (I’m planning to attend their show this Friday in Arroyo Grande.) 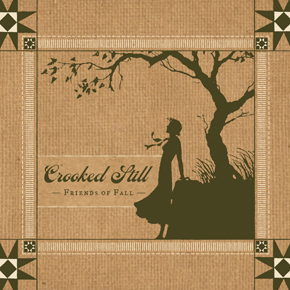 Their new 7-song EP titled Friends of Fall was released October 11th on Signature Sounds. Since their early days, the kids have wandered a bit from the traditional pieces that were the raw material for their modern explorations. This release features creative covers of the Beatles, Paul Simon, and John Hartford as well as original pieces and a musical adaptation of a Wendell Berry poem. Yet they remain rooted in old-time Americana, with a lovely rendition of When Sorrows Encompass Me Round, and a soulful take on Pretty Bird, from the pen of West Viriginia’s legendary Hazel Dickens, who left us behind on April 22 of this year. Her songs are in good hands. Fortunately for people who don’t live in any city in which they’re playing soon, the band will be webcasting their live performance from the Freight & Salvage Coffeehouse this Thursday, November 11 at 8 p.m. PT. The webcast can be viewed at http://www.concertwindow.com/folk. PPV tickets (for an HD feed) are only $3. Looking forward to the webcast, Love the music! All the best! I’m interested in hearing those Beatles covers. Is this the first album they have done covers on?